This is a widget that I created that keeps track how long it has been since my ATR and how long it has been since my surgery. You can also add this to your sidebar, and it’ll keep track of your dates as well. If you’ve just created your blog, go to your blog first to log in. To setup the Achilles Timeline Widget, after you login, click on “Users” on the top far right-hand side. Once you click on “Users”, you’ll see 4 sub-menus. One of them is “Your Achilles Profile”. If you click on it, you’ll see the page “AchillesBlog User Profile”. Please enter your Achilles information there. Lastly, from the “Design” tab, go to “Widgets” sub-tab. You can see all the available widgets on the left side, and the current widgets that you are using on the right side. On the right side, you’ll also see a pulldown menu, showing different sidebars where you can add the widgets to. On the left side, (the Available Widgets) you should see the widget called “ATR Timeline”, and add it to any of the themes and any of its sidebars you want by clicking the “Add”. When you do that, you’ll see that widget added to the list on the right side. You can drag it and reorder how the widgets appear. Then click “Save Changes” , and that should be it. You should be able to see the widgets appear on your blog. As an added bonus, you’ll now see your Achilles information on the NYC Marathon Achilles recovery tracker. If you have any questions or you want me to do this for you on your behalf, please let me know. I have more things planned, including the progress tracker. Also, any suggestions or feedback is greatly appreciated. kristinatl - I’ve enabled them on your page. I fixed the instructions on how to setup the Achilles Timeline Widget, so it’s more straightforward. I’ve already setup your page with the widgets, but can you please follow along with the instructions and see if you are able to find the right settings to change? If one person actually speak out about unclear instructions, then it’s probably true that there are many more that have experienced the problem and didn’t say anything about it. (Probably several orders of magnitude more..) Yikes! Anyone seeing weirdness with the site-wide comments? The comment editing plugin on IE sometimes displays white background patches on the right sidebar for me, and I wanted to know if it’s just me. tennisjunkie - when was your date of achilles rupture..? Recovery List has been added to the main site! On http://achillesblog.com/ you’ll see a list of Achilles Bloggers and their current weight -bearing status. The information is directly gathered from your Achilles Profile so if it’s not up-to-date, please update your Achilles Profile. I’ve written it as a widget so you can also add it to your blog if you like. Nice job on the recovery list! Looks great. You’re the best blog monitor ever. Hey–how’d your first massage therapy go? Massage didn’t happen unfortunately. The massage therapist called early in the morning and canceled the appointment because she was sick. The bizarre thing is that she didn’t offer to set up an alternate time either, so it looks like my search for a good massage therapist is back on. If you haven’t already, please update your info (including which city you are blogging from) in “Your Achilles Profile”. It helps everyone stay current with your recovery status. All you need is just an account (not even a blog) to setup your achilles profile. I sent comments to Hoss’ blog and they aren’t posting– they are sitting “awaiting moderation”. Do you know what that means? It means that Hoss has turned on an option that allows the blog owner to check the comments before allowing them to be posted on his/her blog. It’s turned off by default on AchillesBlog, but you can turn it on any time. I just fixed it.. please let me know if you still see the problem though. It’s a green for go from me ! i can’t work out how to include pics on a post. …or is the anaesthetic causing me to be even thicker than usual? While you are writing a post, you have to click on that grey star, next to the label that says “Add media”. From there you should be able to add the pictures. Let let me know if you have any other questions. Marianne, don’t purchase a boot ahead of time. They will, likely, have stock on hand. Also, my experience is that with the number of different brands/types of boots, that your doctor may have a disposition for/against different types. The last thing you want to do is spend a bunch of money on a boot your doctor doesn’t approve of. I actually had the same question before I was put into a boot. In addition, your doctor should provide it for you and bill your insurance. (If you are covered by a medical insurance.) There will probably be an orthodist (sp?) who will help you fit the boot and instruct you on how to take it off, put it on, etc. I’m not seeing that widget on my list of options. What am I doing wrong? Please let me know if you still have problems setting this up. How about a “Gallery of Scars”, or Hall of Scars?? Just a link where people can post one picture with name, ATR surgery date and date of picture. We are all curious as to what others look like. Doc Ross - That sounds pretty cool. Let me look into how that can be programmed. I think it’ll take a bit of work. Maybe it can be part of “Achilles Profile”. I’ll look into it. thanks! Some of your “Location” info may have been erased due to a bug in the software. The bug has been fixed, so it shouldn’t happen again. I’ve discovered a slight rounding error in the code that was offsetting some of the recovery days by a day. It’s been fixed. gonz09 - Hi, please go to: http://achillesblog.com and click on “Signup Here” on the upper left hand side. I hope this helps! catnboot - It looks like you didn’t “activate” the plugins from the “Plugins” tab. I’ve activated all the AchillesBlog specific plugins for your blog. You should now see them in the list of the widgets. Hey there, just added your NYC and the ATR widgets, but left some settings blank… now they are both out of whack. The NYC one says I’ve already recovered and the ATR one says I have something like 2800 days left… weird stuff. I’m totally new to this site. Just had surgery last Tuesday and found you guys a couple of days ago and am excited about the online support group. Needless to say, I’m a bit clueless on how to do anything other than activate or deactivate your widgets and I couldn’t find anything to modify my settings to get them to work properly. Please help if you have time. 533studios - Hi, what is the address for your blog? Let me take a look. I cannot set up the timeline. When I click the link it just keeps putting me back on this page. Please help. I’ve been able to get the achilles timeline to work but the marathon tracker shows 0 miles in progress. I tried reinstalling the marathon widget but still doesn’t work. richcarbon - it looks like you set the ‘goal date’ to be some time in march of 2009. Which is in the past. This confused the widget.. I’ve just cleared it so that your goal date is by default 365 days from the date of your surgery. I’ve also had to reset your password so that I would check your settings. Please reset your password back to what you want it to be. hi - i left a message as cat on positive vibes but when i logged on i am catuk - i am so computer illiterate what do i do next to keep in touch? catuk - I think you signed up as “catuk”. Just leave messages at “catuk”, it should be okay. You can just keep checking back on the pages that you left comments on to see if people responded to you. Otherwise, just check the main site and search for either ‘cat’ or ‘catuk’ and see if bloggers are addressing you. One more thing to note is that the main site only keeps track of last several days of comments.. not the entire history of comments. For that, you’ll have to go to the pages that you left comments on. I hope this helps! best of luck on your recovery. Tom - You have to go to the Admin console. Then, on the upper right, you should see “Users”. Put the cursor over it and you should see “Your Achilles Profile”. Click it, and then fill in the date when you started FWB. That should be it. Let me know if you have any questions. Any idea why my marathon tracker is progressing on the group page, but not on my page. Also, I updated my PWB date, but it isn’t showing up on my blog or widgets. Any suggestions? I am two weeks into recovery after rupturing and surgery on the 7th November. I have never had such an injury. My leg is in its second cast and will be for the next month. Are there any excercises that I can do do prevent my calf from withering away, and has anyone any ideas on showering with the cast on. As I was very active, squash, sailing, golf, fly fishing etc, I do get very down being a cripple, any suggestions for this. I’m having some difficulty with the widget timeline. When I click “update option,” I get a big red message that my profile was not updated and I need to correct the dates and resubmit. In the box for surgery, I put my surgery date. But next to it is also a red statement that it’s an invalid date. I don’t know what I’m doing wrong. Are you entering the date in MM/DD/YYYY format? If you were entering today’s date it would have to be 08/13/2010, not 8/13/2010. jhc121 - I’ve setup your Achilles Timeline and ATR Marathon widget on your blog. Please let me know if you have any other questions. Hi Dennis, maybe i’m being really stupid, but I don’t have a User link on the top right side. And I can’t figure out how to post. I’ve used blogger before (not wordpress though) and that was easy so i’m not sure what i’m doing wrong. Help!! Dennis - I am a first time blogger - trying to figure out how to get to the screen that will allow me to do posts - any help would be greatly appreciated. jba77 - To create a new blog, please create a user account first. And then, please send me an e-mail (achillesblog@gmail.com) from the e-mail address that you registered with, and I’ll create a blog for you. Please tell me what your username is, and mention briefly how your injury was caused. This wiki still references images and examples from the MIT site. Almost all the content was migrated from that site. Overtime those artifacts will be migrated here as well. Hi all. My first time posting. Here’s my story. I ruptured my Achilles tendon on April 22. It is a partial rupture, but the Dr is very concerned about the chance of that turning into a full rupture. I went to the ER on Easter(two days after my injury) almost a month ago, and they told me I had a just had mildly sprained ankle and sent me on my way not even bothering to give me anything for pain except for a few pills to take home. The Dr at the ER actually said to me two days after I did it, “Well you are going to have to start moving it around soon and walking on it or your ankle is going to get stiff.” So at that point I was trying to walk on it “not wanting to get a stiff ankle”, and I felt another horrible pain.When I went to my Primary a few days later she was concerned that this is what I had done though, so she referred me to the ortho. The ortho is pretty sure that I tore it worse at the point when I was trying to walk on it due to what the ER doctor said. I am allowed no weight baring for the first few weeks.Then they will change the position of my foot every so often as it heals and re-cast it. They are hoping to get me in a walking cast in a month or so. But hopefully no surgery!!! I don’t have insurance! Having trouble getting the widgets set up. Please help or set up. THANKS! nickokie - you’ll need to create a blog to have the widgets. I’ve created your own blog and you should have received e-mail on how to log in, etc. tcoast772 - looks like you’ve been able to setup the widgets. I noticed that there is a password prompt on your blog. I don’t remember this feature for the blog. How did you set this up? Can’t set up my Timeline at all. Updated all my other info but can’t find the design tab to finish off setting up the Timeline..? I had ATR surgery on 06/07/11 — just graduated today from the fiberglass cast to the boot and partial weight bearing! Truly exciting to be out of the hideous cast and moving forward! Best wishes for everyone’s ATR recovery! This site has been a Godsend to me. Thanks so much and I can’t wait to order an official Achilles Tendon Blog t-shirt! What a cool idea! Hey Daisy, Haven’t heard from you for a while and just read some of your recent comments. You have come a long way and are going great. Exciting, sometimes scary times ahead from now but you will handle it just fine. Thanks, Stuart! You are always so kind to reply to my comments. I can’t get over how my left leg looks after the cast was removed! Talk about the Cryptkeeper! Yikes! By the way, I completely agree with you about cold stretching. As a former ballerina and now a teacher, we don’t hit deep stretches until well into the barre. Warming up the feet and turnout muscles with smaller movement exercises until we progress to the genuine stretches. I would think this especially important for athletes in sports disciplines like running which seem to require a very different physique and muscle response than ballet dancers. Professional dancers, as you would probably guess, tend to be hyper-flexed and mobile in their joints. We make terrible marathon runners generally — although, of course, there might be some great ballet/marathon fusion athletes out there I don’t know about! Anyway, sorry for going on and on! It’s an excellent point and I know I, for one, will be thinking even harder about the warming up process in future. Thanks for all your terrific advice on this site! Hi there..Great site…how do i get the blog going? peterc - To create a new blog, please create a user account first. And then, please send me an e-mail (achillesblog@gmail.com) from the e-mail address that you registered with, and I’ll create a blog for you. Please tell me what your username is, and mention briefly how your injury was caused. (The amount of spam blogs that gets created on the site is becoming unmanageable, so I’ve decided to restrict creation of blogs to just me.) I check the site frequently and check AchillesBlog e-mails from my phone, so it’ll won’t take long for you to get your blog up and running. is walking in a boot with no crutches considered partial weight bearing or no weight bearing? srcamm - walking in a boot without crutches is considered FWB. That fateful morning, I did the normal stretching I do in the morning and as I walked away after completing the exercises, on the 5th step I pushed off from my toes as I have been doing since the cast came off and POP it went, it was pretty much a “non event”, not much pain this time compared to the first time, but an immediate gapping hole in my Achilles was evident and an overwhelming emotional pain hit like a tsunami and flooded me. I almost went into hysterics, just thinking of what I had already been through and to have to start from square one was really hard to take. After a few minutes I collected my self, and just accepted once more and tried to look for positives and put things into perspective, as timely as an Achilles re-rupture could be, the movie Touching the Void happen to on that night. Watching that guy go through his struggles, really made me feel lucky, but still can’t get over the fact that it’s happened again. But this time round I would like to document the process as I know it can be quite traumatic to have a re-rupture. I followed all the instructions to set up a blog, but had no success. I re-ruptured my Achilles 6 days after my 1st surgery. 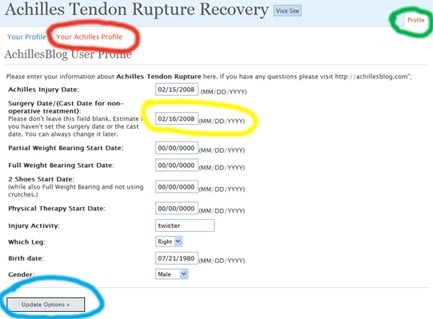 Under “Your Achilles Profile”, should I put down dates from my 1st or my 2nd rupture/surgery? I sent an email per the blog page creation instructions and can not seem to find the design tab to create my blog. Can you provide me some assistance to get this going? Seem to be unable to update my profile for the timeline widget. I ruptured on 28/10/2012 and had surgery on the 31/10/2012. I keep getting This date is not valid when trying to update next to my Surgery Date field. I have put them in day/month/year format. Please excuse my silly question as i’m not that flash on computers. I’ve recently ruptured my Achilles and wanted to setup a blog, but am unsure how to do it. It keeps taking me back to the main menu. Hope you can help. What is FWB here? Is it when you are able to walk inside the home without crutches? Is it when you never revisit your crutches? bikerchic, did you send Dennis the email described near the top of the Front Page of the site? He usually creates new blog pages in batches, every few days. So I created my account but have am having issues figuring out how to write my first post. Anyone else having this issue? i’m stuck on this page. if i go to link for blog, i don’t see where it lets me create one? Hi guys…I am also struggling to figure out how I can start a blog. I recently tore my achilles tendon playing basketball (tore on 5/2…surgery on 5/5 & first post-op on 5/18). I’ve played all my life and even some college ball. I am in utter shock and feel like this is my punishment for something. I have spent a lot of time on this blog, and I really enjoy reading everyone’s story. Never thought I would be a blogger, but I think it will help me get through this. I created a user name and have my own password. Thanks for the help. Looking forward to the day I can dunk a basketball again. Hi Guys! You need to email Dennis to make you a blog page first. He’s the only one who can make it to limit the spammers on this site. After that you can edit and change the appearance. Good luck and Happy Healing. Hello! I think I created a blog, but don’t see how to choose widgets, design, or create a blog entry. Ive added info up until the “design” tab. I don’t see it anywhere! Trying to display the nyc tracker on my page…..
Don’t worry, I had the same problem. The third paragraph on the main page has an email you must write to. Hi Dennis, I am having trouble on creating a blog. Not sure where to find it. Can you help me get started?